A coalition of local environmental activists pushed for the Climate Plan amendment to be included in the Dallas city budget. Courtesy of Rita Beving. Dallas City Council and mayor responded last week to environmentalists' push for a city climate action plan. The Council gave unanimous approval of the environmental initiative at the final City budget vote Sept. 18. It was a 180-degree turn from past eras at City Hall. For months, green advocates have been pushing Dallas to cut carbon emissions, speaking out at City Hall and Town Halls across the city. After two prior unanimous yes votes in committee, the climate plan amendment moved on to City Council and was approved Sept. 18 as part of the budget. Only seven of more than 109 budget amendments made it into the finally adopted 2018-2019 budget. Dallas has inventoried greenhouse gas emissions since 2000, reduced emissions from City operations and publicized this on GreenDallas.net, but that’s as far as the greenhouse gas emissions reduction effort went. Dallas Councilmember Sandy Greyson, center, with Corey Troiani, Texas Campaign for the Environment's DFW director, and Rita Beving of Public Citizen, speaks at a press conference following the vote. Photo by Linda Cooke. Dallas Councilmember Sandy Greyson, the amendment’s sponsor, spoke at a post-vote press event/celebration outside City Council chambers last week. Mayor Mike Rawlings signed the Mayors Climate Agreement, now with more than 630 mayors signed, at President Trump’s announcement of U.S. withdrawal from the Paris Agreement in 2017. “With no current state or federal action on climate change, it is apparent that local governments must shoulder the burden," said Rawlings in a statement. "The City of Dallas accepts this responsibility and is actively working towards building a greener, more resilient city. Addressing climate change should not be a controversial or partisan issue, and local leaders and the marketplace should work together in pursuing climate action." “The climate plan will be developed in partnership with the Office of Environmental Quality and Sustainability, a well-qualified consultant, and a public process including stakeholders from business, academia, health, environment and other leaders throughout the community. The plan will include actionable and quantifiable measures [for] a broad spectrum of [sources], including transportation and transit, solid waste, building codes, energy purchases and use, and more, including climate and urban heat island initiatives in the Resilient Dallas plan. "The budget allocation includes a consultant to help assess and analyze the most prudent and cost effective measures…. It will also help [consolidate], make more effective and get credit for initiatives in other City of Dallas departments that have climate impacts. 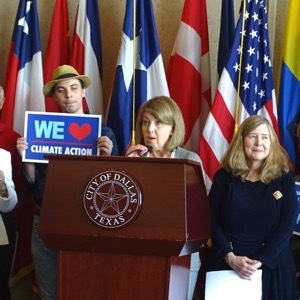 Rita Beving of Public Citizen, the national consumer advocacy nonprofit, noted that five other Texas cities have signed on to protect climate, with the Mayors National Climate Action Agenda. In a later interview, McGuire gave an update on the status of climate efforts already underway in the Office of Environmental Quality and Sustainability. How did the shift to stronger climate action come about?